Somerville House students looked behind the scenes of the mining industry when they visited Peabody’s corporate offices at South Brisbane today. 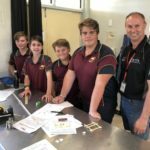 The event is part of the school’s Queensland Minerals and Energy Academy (QMEA) activities and broadens their understanding of the careers available in the minerals and energy sector. 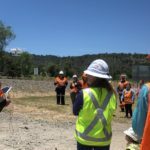 “We’re very happy to be hosting the girls and want to show them how we use technology to contribute to efficiency in our operations,” said Peabody’s Gina Adamthwaite. “We also want to ensure that the girls understand that women are encouraged to work in the resources sector in a full range of careers,” she said. Gayle Harris, Head of Senior School at Somerville House said the excursion was a great opportunity for the girls to meet and network with people in the resources sector. “It will also help them to put in perspective the practical uses of their classroom activities,” she said.